With a wealth of market and regulatory changes impacting the medtech sector, it’s time for digital technology to steer the direction of your future business. This expert webinar will evaluate how to strategically embed digital within your own organisation and explore the challenges and the opportunities for transforming customer relationships, driving commercial outcomes. 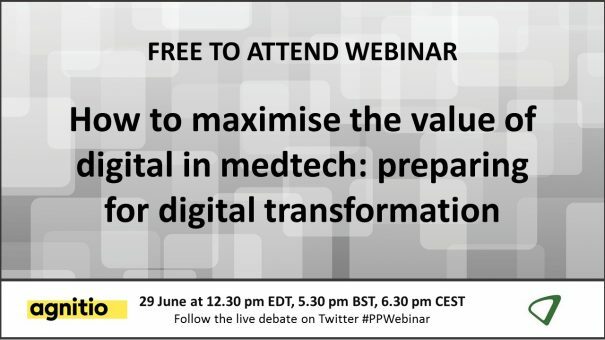 The live webinar took place on Thursday 29 June at 12.30 9m EDT/5.30 pm BST/6.30 pm CEST. To watch the on-demand version, please click here or on the buttons above/below. Jerome has extensive expertise in digital marketing and the medtech industry and leads the development and execution of a digital strategy for transcatheter heart valve (THV) therapy development in his role at Edwards. Jerome has over 10 years of experience in digital marketing, strategic and tactical planning and project delivery, and has previously worked for Beckman Coulter, Shire and Essilor. He holds a Master’s degree in International Business Management from ESCP Europe in Paris. I am a commercial leader with over 16 years sales and leadership experience across a range of blue chip organisations. My philosophy is aligned to harnessing a growth mindset by being curious about how to adapt to the market environment and ensuring we improve ourselves, each other and our businesses. I also like to remember to have fun along the way. Currently, I am the general manager of Syncera Europe. Recent roles at S&N include leading the largest Trauma, Limb Reconstruction and Extremities Division for Smith & Nephew outside of the US, followed by the UK&I commercial and sales excellence director role, working across all four divisions of S&N UKI organisation. Part of this role included delivering the Arthrocare integration in UK&I, process design and digital deployment within our sales excellence and onboarding teams, as well as the leading the design, launch and change management process of a new digital solution for the European wide 1000 strong sales team. My MBA focused primarily on launching new business models through enabling technologies in the medical device market as well as the resulting sales force effectiveness strategies. This webinar will be Bryn’s personal thoughts, experiences and learnings. Georgia leads the newly created Value Creation organization for Johnson & Johnson Medical Companies focused on creating value based partnerships with hospitals and healthcare providers. Leading the launch of CareAdvantage for the EMEA region, Georgia is focusing on enabling key capabilities within Johnson & Johnson to foster stronger connections to the healthcare environment. Georgia also leads the Value Creation Council, which is made up representatives of the key markets across EMEA. This council evaluates new technologies, identifies opportunities for accelerating innovation, and provides guidance on implementation support to deliver value to hospital healthcare providers. Georgia brings more than 10 years of experience in the Medical Device and Diagnostics industry with Johnson & Johnson across multiple geographies, businesses and healthcare environments. Her broad experience allows her to bring the full capabilities together across Johnson & Johnson and drive development of tailored solutions. Dave has worked in the pharmaceutical industry for over 20 years, with a focus on digital communication, content, and transformation. He has held a number of high-profile roles at UK, European and a global level, both agency and client side, and has experience of creating digital transformation both inside and outside of healthcare. Dave has also worked in four online communities, growing, nurturing and commercialise audiences. He is also a university lecturer on the MSc course in marketing, specialising in customer engagement, content marketing, agile marketing, digital transformation and behavioural science.